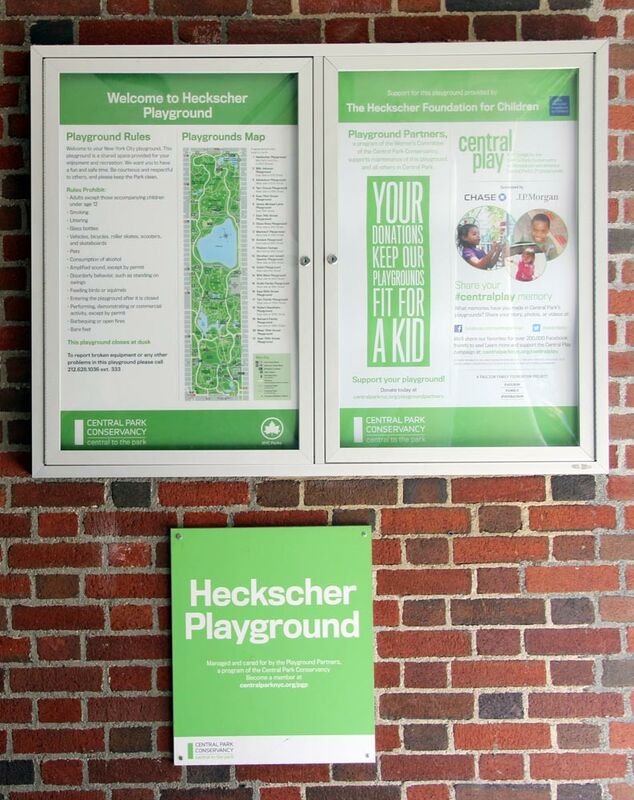 Sign at the entrace to Heckscher Playground in Central Park. Before the New Deal, Heckscher Playground was the only playground in all of Central Park, and prior to 1926 there were no playgrounds at all. In 1935 a plan was announced for the "complete renovation and redevelopment of the area", to include a memorial to Sophie Loeb, a new wading pool, a renovated recreation building, and "swings, slides, see-saws, jungle gyms, horizontal bars and ladders for children, and croquet and horseshoe pitching courts, separated from the children's area, have been included for adults." NYC Parks Department press release, March 24, 1935, plan for Heckscher Playground renovation. NYC Parks Department press release, December 30, 1936, opening of reconstructed Heckscher Playground. New Deal Assistance in NYC Parks Department Projects, 1934-43, which explains how all Parks Department work 1933-1938 (and much of it until 1943) was with New Deal, funding, labor, and/or design.